To start racing with us you'll need to have some plugins and tracks (we're rarely using stock Kunos' tracks due to pit numbers), and alternatively you can download custom liveries of other player's cars. You can download 7zip archives manually, or use our ACEM application to simplify the process. You can find it here. 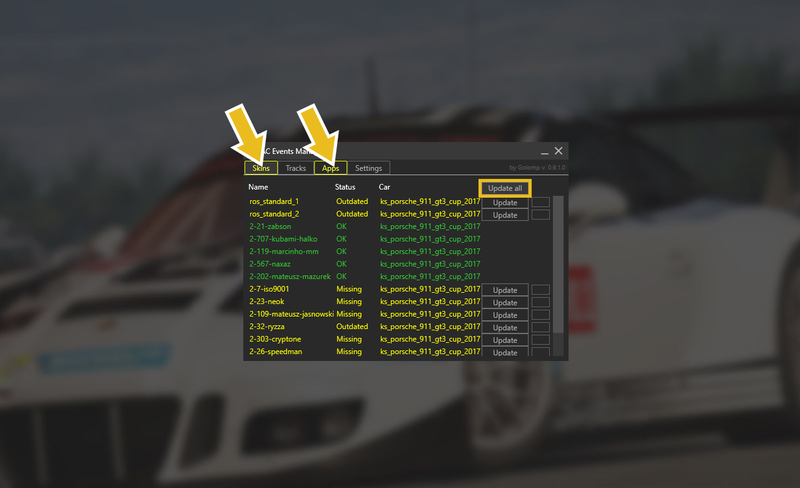 ACEM is our custom app to help with automated downloading of required content and adding it to your Assetto Corsa installation. It checks what you have installed and prompts you to download only what's missing. So unlike other leagues, you don't have to download a massive zip file if you only need to add few missing liveries. It really works and helps out. It also checks for updates, so if any driver update their skin - such change will appear in ACEM automatically for everyone. It's recommended to use ACEM, however it's not required - the same files are available in DOWNLOADS section, and can be manually downloaded from there. ACEM is created with simplicity in mind. All you have to do is to unzip it, anywhere. On first launch - go to Settings tab and check if the path to Assetto Corsa is correct in AC Location field. App should detect it automatically, but it's always worth checking. If it's not correct, fix and restart the app. Then it's as simple as clicking Update All in all tabs you want to sync. Items marked in yellow are either missing or outdated and have to be redownloaded. Don't close the app until all downloads are finished. That's all, some extra actions might be required for some apps - we'll take a look at this in the next chapter. Content Manager - alternative launcher - seriously get it as it's miles better/faster than original. Tons of additional features. Definitely worth donating to unlock full version too. Car Radar / Helicorsa - either are handy in close combat - both showing the top view of your car and cars around you, so you know whether you can move to the side without causing contact. Crew Chief - your virtual spotter/race engineer app - this handy and highly configurable helper will tell you about your lap times, status of your car and tons of other useful things. Can be sweary too. Imagine there's more people than people can fit in one server. We can have multiple servers but how we allocate people to the race servers? You guessed it - by prequalifications. Prequalifications are open between the events, usually are opening shortly after previous race finishes and are finishing day before the race. So there's roughly a 2 week window to set your time there. The rules are simple, the drivers with fastest times are going to PLATINUM server, then next batch is going to GOLD, SILVER, BRONZE and so on until all spaces are filled in. This helps to have closer races based on performance. Now, there's no limit on how many laps you have on prequalification server, the more you train, the better chances for faster lap. Plus you'll get the better understanding of track and conditions as they won't be miles away from race conditions. Your aim is to get the quickest time possible on board. Your laps should automatically appear in prequalifications page, there's a short delay but the prequalification table autoupdates itself, so you can keep an eye on your progress. There's a minimum number of valid laps required to successfully go through prequalifications stage (usually 10, but check the event rules as it can be different) and you also have to click the Sign up for race button. That second stage is to confirm whether you will be able to participate in the race - your space will be reserved then. If you can't race for whatever reason - click Sign out from the race, that way you'll free up the space to somebody else. It's not good to book a space and not attend the race. Think of others. If you're using Content Manager skip to next section, otherwise carry on reading. To join our servers you have to know its name and password. In events view you can see the password as well as the server details. 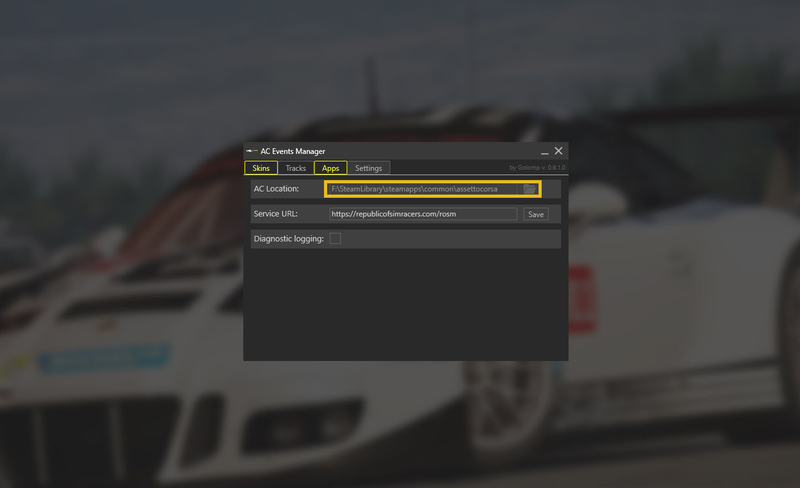 To connect, in Assetto Corsa go to Main Menu, then Drive and from the top menu pick Online. The easiest to get to our servers is to find it by the domain - republicofsimracers.com. There might be multiple servers, all should be labelled to match the event you're signed up to. Sometimes, prequalifications are using multiple servers to allow breathing space (wait for the last day of prequalifications and you'll understand! ), they might have numbers ROS #1 i ROS #2. It doesn't matter if you've been on server #1 before, results are consolidated from all servers and displayed in the table regardless of which server you've set your times on. 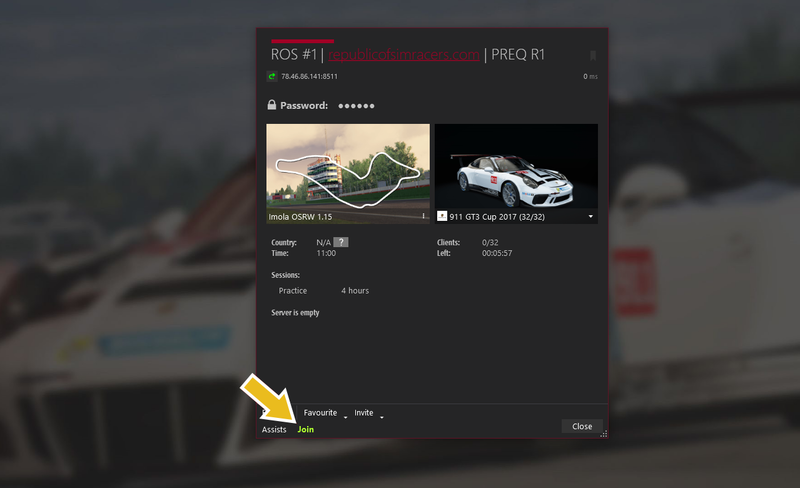 In race view you can get the server reference and the password - pick the right server from the list and type the password in Enter server password ... Finally click join on the right-hand side. If you're using Content Manager - it's as easy as clicking the links to the server - Content Manager will automatically open the right server and pre-populate the password field. Piece of cake. 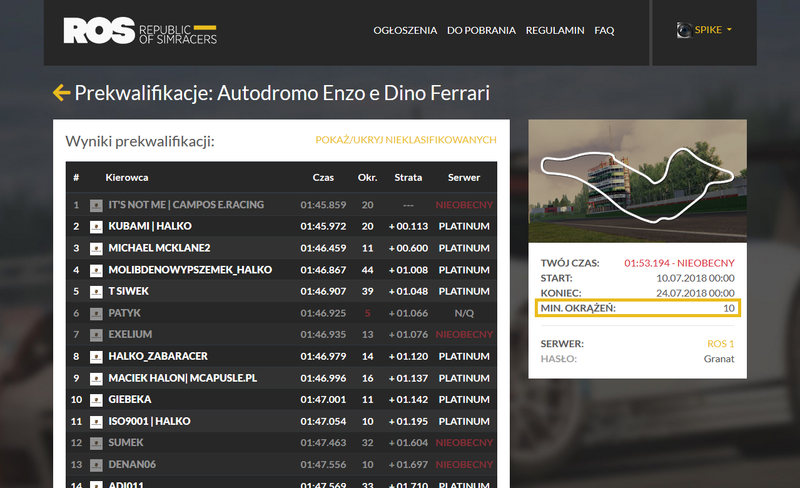 Your best valid lap time is displayed in current Prequalification results screen. As mentioned before, you need to meet minimum number of valid laps and also your time will determine the server you'll be racing on. Remember - there's no penalty for not taking part in a race, unless you sign up for it and won't show up. So make sure you sign up only when you're 100% sure and committed to take part in that race. Sign up status can be changed up to the end of prequalifications. After that - you can't change your mind. Once you're sure you'll be fine to race - click Sign up for the race and you'll be automatically added to the entry list to the server dictated by your prequalification result, given that you've met minimum valid laps requirement. If you see a green check on prequalification list - that means you'll be racing. Red cross means that something is not quite right - hover over it to see what's missing. We recommend to familiarise with the event/season terms - even if it's not your first one with ROS. There might be some small changes between seasons - you're obliged to know them. Not everything is written down, a lot is down to common sense. If you're unsure about something - just ask. Bear in mind that causing collision can (and probably will) result in penalty, harsh accidents can even result in disqualification from the race or even the season. We thrive to have good, respectful racing. We also have an Onboards section where users can add link to their onboard. A lot of our drivers want to share the tips and we encourage everyone to do the same. Watching them is a good way to learn new techniques, or even you can familarise with braking points or racing line before going to the track. Please be aware of other drivers, don't treat them as enemies - give them plenty of respect. 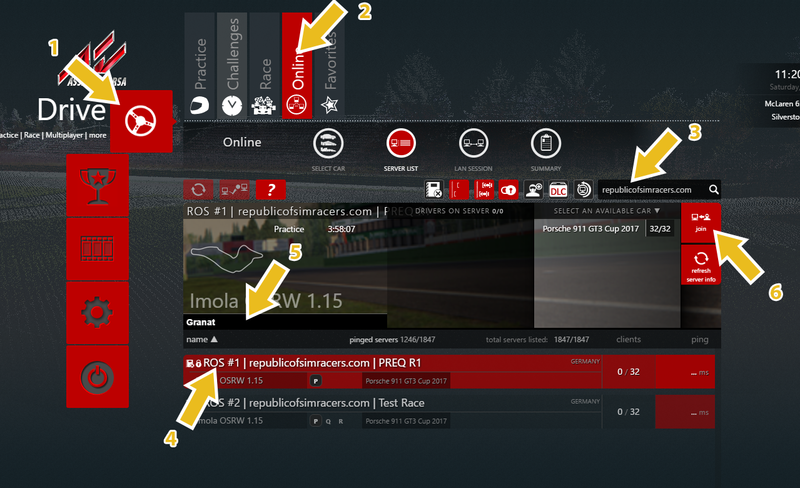 We're a community which likes to share information, setups and other simracing related topics. We hope you can contribute to it too. We could go on for days explaining various areas of the ROS and the community, but we'd end up with a guide too long for anyone to read! If you have any questions - ask us on our Discord, we'll be happy to help! See you on track!